Introducing the new Guard Trail feature! Guard Trail is one of the many amazing features the newest QR-Patrol GOLD version includes! This new addition makes it easier for the Managers to track the Patrols performed: the system automatically draws detailed graphics on the map which indicate the path it was followed. The results can appear either on a static form, or as an animation! Under the “Tracking” section on the new screen that will appear, enable the Tracking feature by checking the “Enabled” checkbox and adjust the “Check Interval” (i.e. Time interval between position updates) as per your preference. Tip: The smallest the Time Interval, the more periodically the system will get position updates and thus the results will be more accurate! 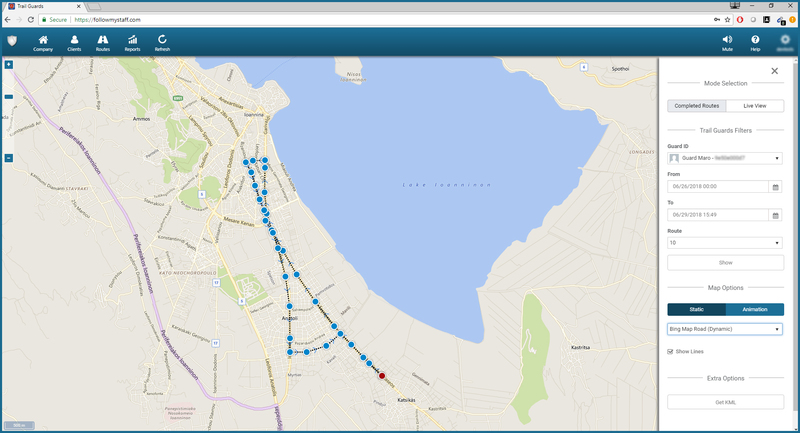 Under “Mode Selection”, you have the option to view your Guards’ completed routes by selecting “Completed Routes”, or a live view of their current ones with “Live View”. Under “Map Options”, you can either select the “Static” or the “Animation” option for the Trail depiction; the latter one depicts the Trail in an animated way – to start the animation, adjust the speed to your preference and press on “Start Animation”. Under “Extra Options”, you have the option to export a KML file by pressing on “Get KML”. Select the map layer you prefer and Enable/Disable the “Show Lines” and “Follow Last Position” options according to your preferences.